What Are the Best Cigar Humidors of 2017? 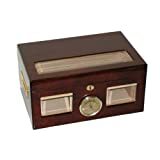 Anyone who enjoys a good cigar knows that a personal cigar humidor is a must. Practically speaking, you need proper storage for your cigars. The only way to do this is with a humidor. Cigars should remain free from humidity to stay in condition and keep their flavor. Humidors maintain a constant, controlled environment for your cigars. It replicates the conditions in which the tobacco grows. Before I get started, here is a little humidor trivia. Most sources recommend that you air out your humidor from time to time. According to the Cigar Journal, this is completely untrue! The more you expose a cigar is to open air, the more it loses its bouquet (and its flavor). The following are my top picks for the eight best cigar humidors on the market for 2017. Note that this list does not include travel humidors. I included those in a separate article. As the title indicates, the Milano 75-100 cigar humidor holds up to 100 cigars, which is a good amount. It is all wood with no glass door at the top end to view the cigars. This may be a detractor for some who prefer to view their cigars without opening the box. This model features a round humidifier and a hygrometer that keeps the humidity in the air from damaging the cigars. It also has a stylish gold-plated lock that gives the box a sophisticated look. On the downside, there is no separator inside the box to keep your cigars organized. The Prestige Import Group humidor comes in different sizes and colors. My preference is the Monte Carlo with the cherry finish. It holds up to 120 cigars. Though, we have found that it only holds about 100 cigars rather than the 120. This model has two dividers that you can use or remove at your discretion. It also has a removable cedar tray. The box itself has a solid construction. The overall look of the piece is distinguished regardless of the finish you select. Also from the Prestige Import Group, the Modena humidor is another well-designed piece. This one claims to hold up to 125 cigars. Though, I recommend no more than 100 to prevent crowding. I prefer the rich cherry finish with this model as well. Though, they all have a rich finish. The Modena has an angled storage design with four adjustable dividers. This creates a display that is appealing to the eye. It also protects well against humidity, as it has two humidifiers. The only negative I have found is that the magnetic seal seems to be weak. The Scorch Torch, with its fun name, is one of best cigar humidors in its price range. It comes in at under $30 on Amazon. It holds up to 70 cigars vertically. It is a smaller model but is good quality for the price. One disappointing feature is that it does not perform as well as the larger models when it comes to humidity control. The Milano brand is one of the oldest and most respected in the industry. They make cigars as well as humidors. This explains the higher price of this humidor. This Milano glasstop model holds up to 100 cigars. It also features “sure seal technology” that keep your cigars in proper condition. It comes with a cedar tray with a divider, which is a nice plus. There are one humidifier and a glass-mounted hygrometer. The Mantello desktop humidor is one of the best cigar humidors with a glass top. It holds up to 100 cigars as the title states. It has a pleasant look as well as a removable tray with divider. It also has a lock and key set, which adds to its style. This model has a simple style with a glass top that allows you to show off your cigars. A smaller version Mantello, this model holds around 50 cigars. It has a simple design with a scratch-resistant, tempered glass top. It features a magnetic humidifier and a secure seal to control humidity. It also has a removable divider. The Montello brand is popular, and the price of this humidor is great. In fact, this is what landed it on my list of best cigar humidors. As a result, this model sells well. You will find dozens upon dozens of favorable reviews. 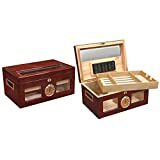 The Hydra electronic humidor is a departure from the others included in this list of best cigar humidors. It is a digitizes humidor that swaps technology for aesthetics. This model is both digital and electronic. It automatically regulates the humidity. The unit has one internal fan and two external fan ports for added climate control. It has its own LED lights, so you can select your cigar without needing to turn on the lights in the room. It monitors humidity every 30 seconds and activates audible alerts when needed. Of course, the price is higher for this unit due to the added technology. Your inner geek may find that acceptable, however. Or you may not find the modern look as appealing as the more traditional models with the rich wood finish. Still, I included this because the technology works as it should, and it makes for a unique conversation piece. Because you enjoy a good cigar, purchasing a humidor should be on your priority list. Correctly storing your cigars is a must so that you can fully savor the moment when you reach for your favorite cigar. Hopefully, this list of best cigar humidors will help you make your selection. All the ones presented are of good quality. Your choice comes down to price point and personal preference when it comes to the look and features.